Around the Bay 30 km. Hamilton, ON. Sunday, March 25 was the 124th Around the Bay 30 km Road Race in Hamilton and my 9th time completing the event since my debut, 15 years ago when I ran it in 2:12. Between 2012 and 2018 I finished the race five times with either a first (x2) or second (x3) in a time of 1:47 (x3) or 1:51 (x2), and in 2010 I was 3rd with a 1:53. For a history of the Oldest Race in North America’s top 10, click here. I’ve always referred to this race as “The Bay” but it seems like “ATB” is now the more common abbreviation. There’s something quite special about ATB. It’s that time of year where runners are finally fine-tuning their training after weeks of winter running in harsh conditions and limited daylight. It creates that butterfly feeling in your stomach when you know that (the true) spring weather is right around the corner. It brings back high school memories for me, before my U of G hockey days, where the outdoor track season is near. Running surfaces are no longer snow and ice covered, and there are fewer layers of clothing to carry. The 30 km race is the light at the end of the tunnel in some ways, and also a gentle, or not so gentle, reminder that the marathon is going to be that much more gruelling. There’s a bit more time to hammer out a few more high km weeks and tough workouts. But for the most part, it’s a bitter sweet feeling that the end is near. Going into Sunday’s race, the plan was to train through. I wouldn’t be “racing it” or significantly decreasing my weekly mileage; 150 km would be close to my 155-180 km range and I’d be completing a decent workout earlier in the week. Coach DST recommended I start at ~3:40/km pace for the first ~ 12 km, then pick it up to the 3:35-3:38/km range for the middle part, and finish strong on the hills as good preparation for Boston. Dan Way and Mitch Free would be joining me in this pursuit but we all knew that perfect plans are difficult to perfectly execute. They were a good ways ahead of me at the Chilly Half but I knew the longer the race distance, the closer I’d be to them. We started out together with about 6 other guys in the mix. It wasn’t that far into the race that we got separated into two smaller groups. I ended up in what I called the chase pack, taking my fair share of leading the group into some decent headwinds. I enjoyed the company but we too dispersed as the race went on. If I had more women around me, I likely would have pushed harder so it was a good thing that it was just me and the guys. I knew ATB was a key race for Dayna who finished strong in 1:49 for her fourth victory so I didn’t even attempt to run with her. After the race I wasn’t sure how I felt. I had never not raced a race before. I rushed back for my daughter’s 1:00 pm hockey game, her last of the season, then completed a longer cool down shortly thereafter where I collected some thoughts. My cousin also completed the race so he and his wife joined us for the afternoon and dinner on their way home. Once I sat down to email coach DST my thoughts, I concluded that I was satisfied with fairly successfully executing our plan. “Temperature was decent. It was windy and I took my fair share of leading a pack of guys into the wind (not the guys I planned to run with, they were ahead a bit and split the first 12 km at exactly 3:40/k!) so not a whole lot to complain about re: conditions. I have enjoyed not being a slave to my watch this year – no standards or criteria to meet based on numbers, which I’ve quite liked. I’ve focused more on a solid effort while being able to handle hills. I know I’m not as speedy as I once was, which is ok. I’m not saying a PB can’t happen again. Rather, the focus has been elsewhere. So, not “racing” today and using it as a good Boston effort = mission accomplished, particularly because I felt solid on the hills. I knew Dayna had this is a key race for her season so I let her go from the start. I think if she was a bit closer or I had other women around me I would have given a bit more. I had a little sprint at the end, which makes me think I left some for Boston. Fuelling was good. Good pay day with overall and masters and a Cdn masters record. Not bad! I’ve taken the day to recover with an easy 15 km run, some stretching and rolling, an epsom salt bath, and a massage to keep me in good form. Aside from the chafing due to four gels stuffed down my bra, I can’t complain about anything else. 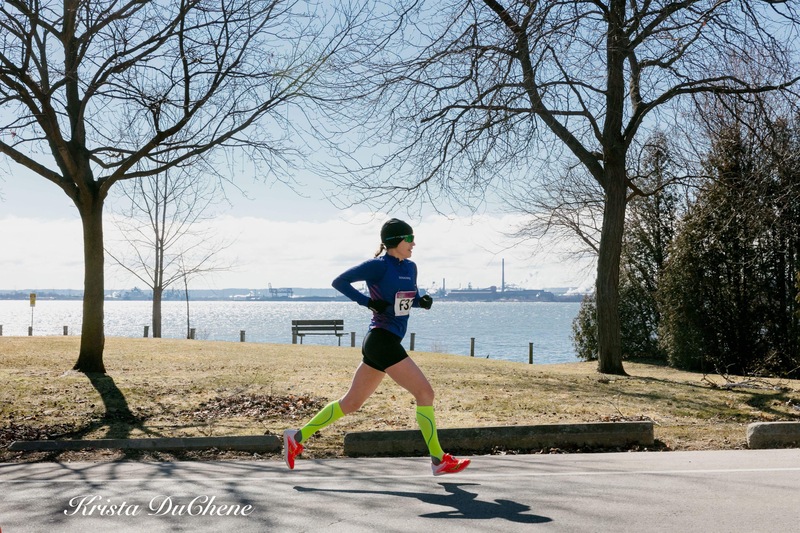 March was its usual busy month with three birthdays, the kids’ peak competitive seasons, March break, two races and peak training but here we are already, just three weeks away from the 2018 Boston Marathon. Enjoy the pictures taken by the talented Edison Yao.